The U.S. market is continuing with the bull rally that started in March 2009. During this time, significant market declines occurred only three time. In 2010, the S&P 500 declined by 17.13%, mostly due to concerns arising from the European Sovereign debt crisis. In 2011, the S&P 500 declined in the wake of U.S. debt ceiling debacle. From 2014 to 2016, the S&P 500 stayed in a range in which it declined 15.21% from May 2015 high to February 2016 low. This influenced by U.S. budget sequestration and Congressional gridlock. Following each of these declines, the U.S. indices have embarked on a multi-month rally. The last one started in February and got another jolt up on November 2016. This leg continues to propel forward. Over this period we have noted many chart patterns and the only significant ones have been bullish formations. They provide us with many meaningful clues for future targets. 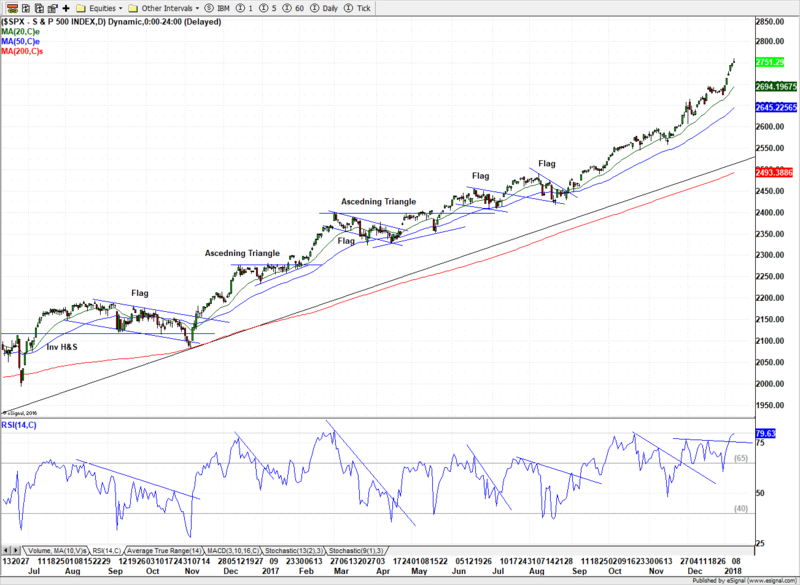 We will analyze the chart patterns on S&P 500 as other major indices are seeing similar chart patterns. We will then compare other major indices with S&P 500 and see which one is outperforming others. 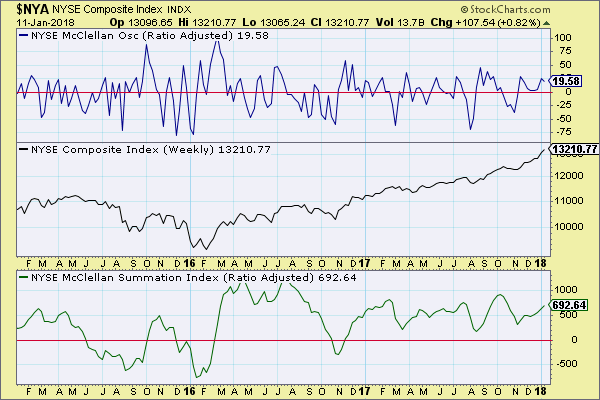 Finally we will look at some of the market breadth indicators to determine if the market is over-heating or not. 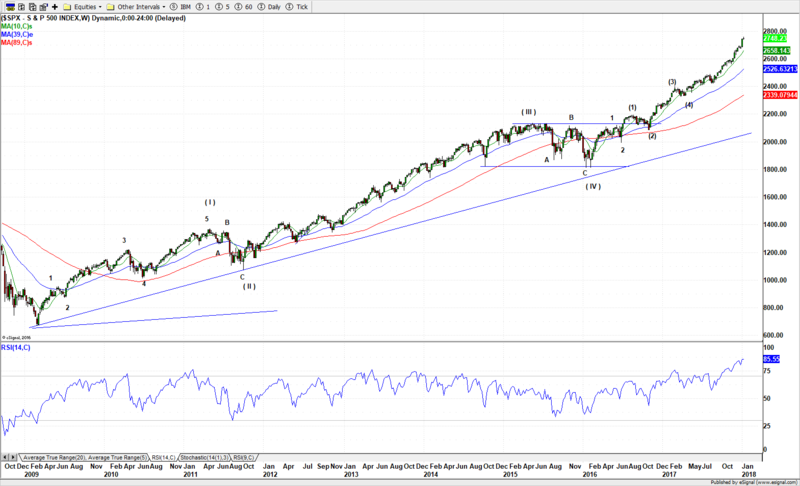 The S&P 500 has been on an uptrend since March 2009. It broke above a long term rectangle or horizontal channel pattern in 2013. The lower limit of the pattern was formed by the lows in October 2002 and March 2009. The upper limit was formed by the highs in March 2000 and October 2007 (see Fig. 1). Let’s call this horizontal channel HrzChnl1. The 61.8% Fibonacci extension of HrzChnl1, formed the upper limit of another horizontal channel, HrzChnl2. The upper bound of HrzChnl2 was made between February 2015 and August 2015. The lower bound was made by the lows of October 2014 and the lows of February 2016.The index broke above this range in July 2016 (see H1, L1, and L2 in Fig. 2). The break was tested in October 2016 and was sustained. The 100% Fibonacci extension of HrzChnl2 was near 2460.00 and the 100% Fibonacci extension of HrzChnl1 was near 2485.00. These two levels are close enough to form a confluence zone. They were achieved in July 2017. The index also stayed within a narrow range bounded by the low of 2407.00 and the high of 2490.00 from late May 2017 to early September 2017. This trading zone is clearly visible as a flag pattern on daily time frame (see Fig. 2). The 161.8% Fibonacci extension was near 2660.00 and was achieved in December 2017. The next target, 261.8% Fibonacci extension, is near 2985.00. In July 2016, the index broke above an inverse Head-&-Shoulder pattern, albeit an uneven one (the lower left corner of Fig. 2). The left shoulder was formed in November 2015, the head in February 2016 and the right shoulder in April 2016. The break up from the neck was in July 2016. The 100% Fibonacci extension target was near 2420.00 and the 161.2% extension target was near 2610. Both of these target have been achieved. The next target, 261.8% Fibonacci extension, is near 2913.60. The Head of the H-&-S pattern was a double bottom formed in by the lows of January and February 2016. Since then the index has regularly made bullish down-sloping flags, pennants of triangles (see Fig. 2). The last noticeable such formation was a flag, which the index broke above in late August 2017. On August 9 2016, we identified Elliott Wave sequence for S&P 500 on the weekly timeframe. This sequence was further analyzed on September 10 2016. Our assessment, using Elliott Wave rules and guidelines, is that we are currently in the fifth motive wave (see Fig. 3). This is an extended wave. In a bull market an extended fifth wave can contain other extended waves too. We seem to be in a one degree smaller third wave extension in the extended fifth wave. The Elliott Wave equality principle says that the fifth wave is usually a Fibonacci ratio extension of the first wave. The length of first wave, Wave (I), from a low of 666.79 to a high of 170.58, was 703.79 points and took 113 weeks to complete. The fifth wave, Wave (V), started from the low of 1810.10 in February 2016. Using 161.8% Fibonacci extension we get a target for fifth wave to be near 2950.00 and the expected time to be in August 2019. Another target could be derived from the Fibonacci extensions of the third wave, Wave (III), which spanned 1059.95 points and took 189 weeks to complete. This gives as a target near 2870.00 in September 2018. Many chart patterns are active and they give us a wide array of targets. Some of these targets form a confluence, which increases the probability of index reaching them Here is a summary of targets. The 161.8% Fibonacci extension of the horizontal channel formed from 2000 to 2013, HrzChnl1, is near 3050.00. The 261.8% Fibonacci extension of the horizontal channel formed from 2014 to 2016, HrzChnl2, is near 2985.00. The 261.8% Fibonacci extension of Head-&-Shoulder pattern formed in 2015 and 2016 is near 2913.60. The two significant Elliott Wave targets are 2950.00 and 2870.00. 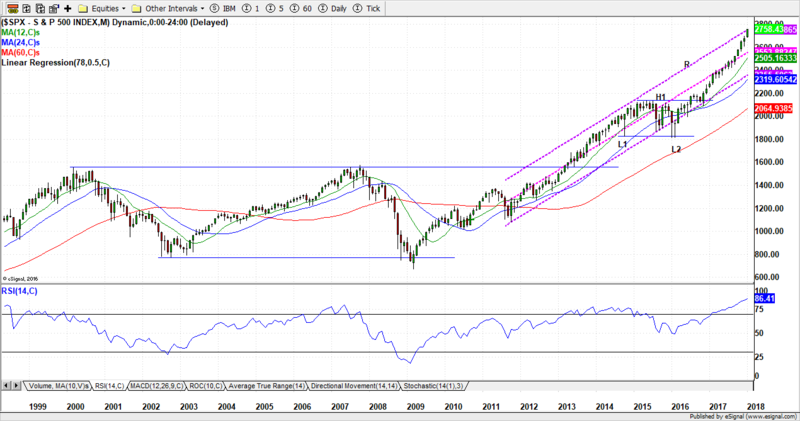 This gives a good target range near 2900-to-2950 and the target date in the second or third quarter of 2019. Major U.S. indices are in strong uptrend. Many of them have also formed many of the chart patterns that S&P 500 has made. However, the performance of all these indices is similar. Some are performing better than S&P 500 and some are not. 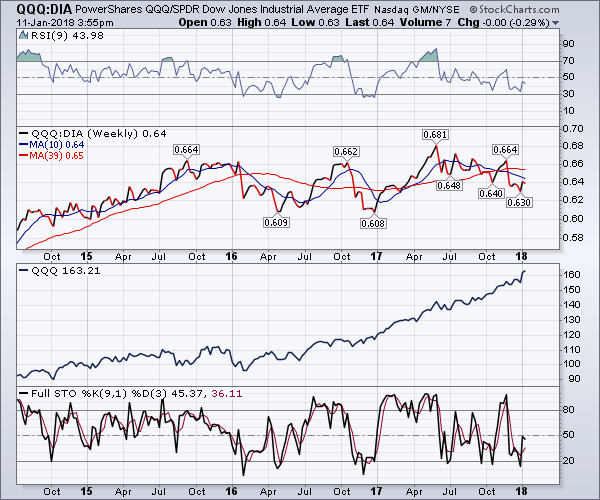 Dow Jones Industrial Average is out-performing S&P 500. Since July 2016, ratio of DIA, SPDR Dow Jones Industrial Average ETF, with SPY, SPDR S&P 500 ETF, has been, mostly, trending up (see Fig. 4). NAADAQ Composite is also out-performing S&P 500 but to a lesser extent. 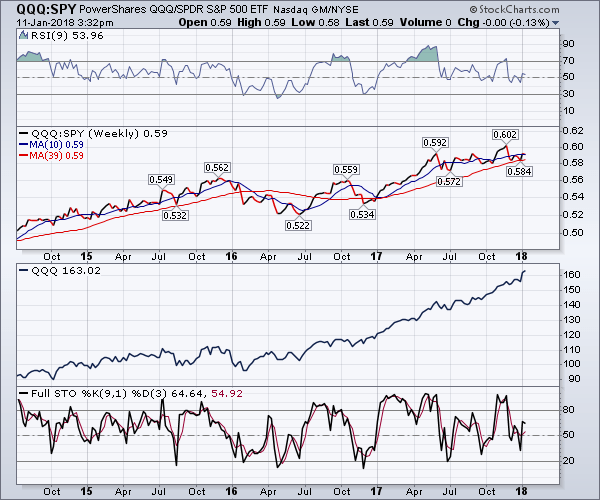 The ratio QQQ, PowerShares QQQ ETF, with SPY has been trending up since mid-2016 after declining for few months before that (see i). 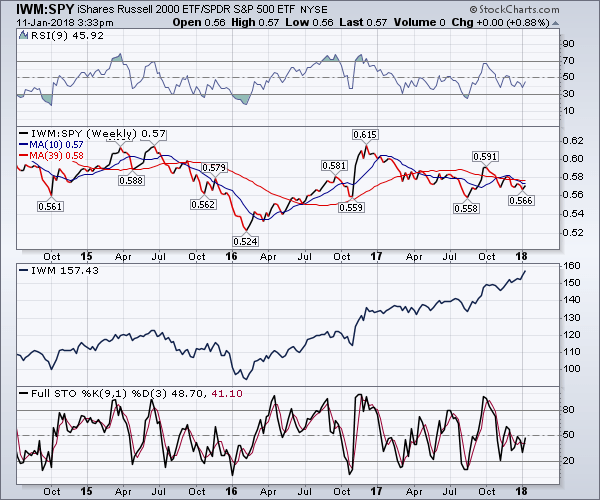 QQQ has been outperforming SPY for a longer time period. However, the slope of QQQ/SPY is not as steep as that of DIA/QQ. Since mid-2017, Dow Jones Industrial Average has been out-performing NASDAQ Composite. The ratio QQQ/DIA is trending down after making a zigzag pattern from early-2016 to mid-2017 (see Fig. 6). Smaller cap and more volatile, Russell 2000 and Dow Jones Transportation Average are underperforming S&P 500. The ratio of IWM, the iShares Russell 2000 ETF, with SPY (see Fig. 7) is trending down since the beginning of 2017. For most of 2016, IWM outperformed SPY trended up. The ratio of IYT (see Fig. 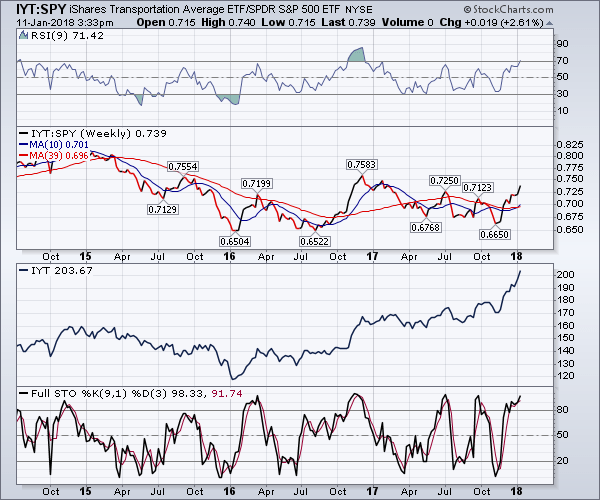 8), iShares Transportation Average, with SPY is mostly trending down from late 2016.. 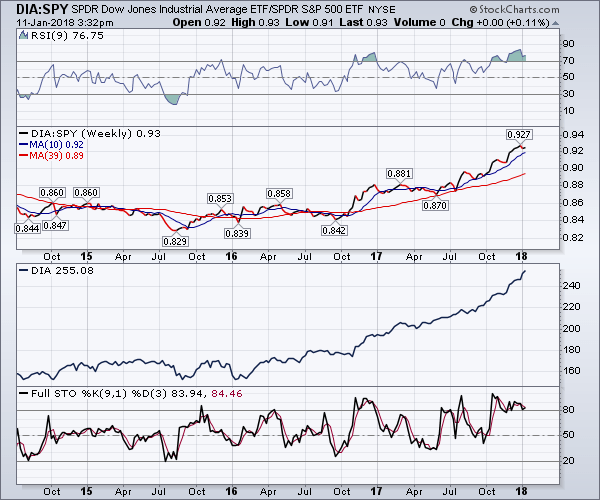 It is rising from the lows made in November 207, which means IYT is doing better than SPY since then. The weekly NYSE McClellan Oscillator stands at 19.58 and the NYSE McClellan Summation index at 692.64 (see Fig. 9). Neither of these readings indicate an overheated market. 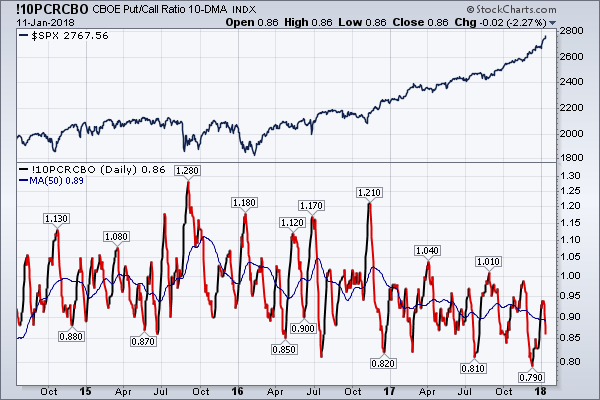 The Put/Call Ratio is at 0.86 (see Fig. 10), which s historically not too low to indicate an overbought market. The 50-day simple moving average, on the other hand, has been trending down since October 2017, which raises concerns. 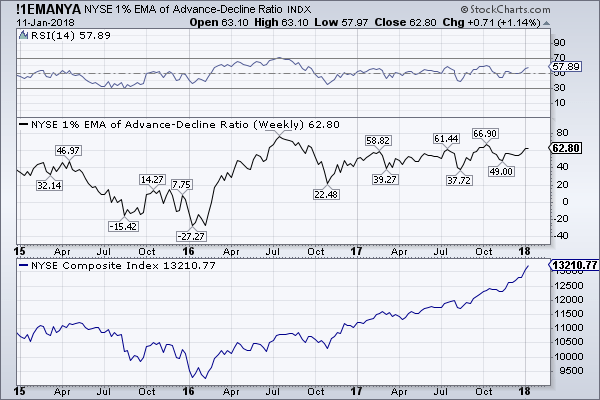 Another indicator, 1% EMA of Advance-Decline Index, is making higher highs and higher lows since late October (see Fig. 11), which means that it is also not flashing any warning signs for overbought market. January 12, 2018 in Market Commentary.